Twice daily Memorial Day thru Labor Day, visitors will have the unique opportunity to feed the Giraffe at the Giraffe Overlook Station on top of the boardwalk. 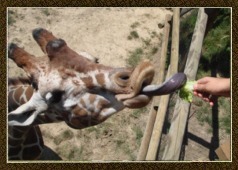 Giraffe Encounters are scheduled 12:00-pm and 2:00pm. Encounters may be subject to change or cancellation. These amazing creatures are wild animals and we can not guarantee that they will stick to our schedule. Quantities are limited. Guests 12 and under must be accompanied by a paying adult.